Boutique Apartment Hotel Featuring a Stylish Blend of Japanese and Western Design. 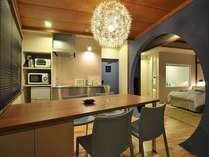 Address Nozawa is an old minshuku (B&B) that’s been remodeled in to a Modern-Japanese serviced apartment hotel. All rooms have a fully-equipped kitchen and each room is designed in a different color theme. Located just steps away from O-Yu Dori, the village’s main street. Onsen baths, laundry facilities, drying room, kids play room are all on the premises making this an excellent choice for extended stays. From Iiyama Station(JR Hokuriku(Nagano) Shinkansen), Take the Nozawa Onsen Liner bus and get off at the Nozawa Onsen stop (approx. 25 min.). Then 3 minutes on foot.